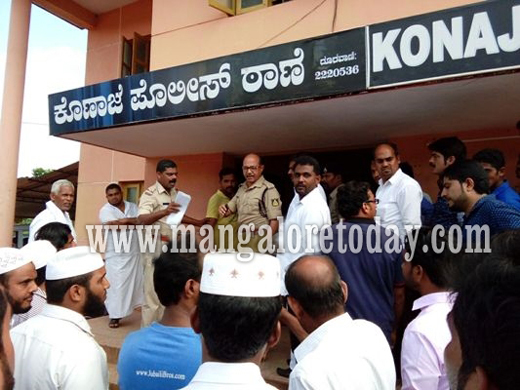 Mangaluru, Dec 1, 2015 : A person who is in-charge (Moilar) of a mosque at BC Road was allegedly attacked by a gang of five assailants at Mudungarakatte at Balepuni near Mudipu on November 30, Monday night. The victim has been identified as Muneer Ahmed Saqafi. It is learnt, the assailants who came by two bikes waylaid the Moilar and attacked him with iron rods near the government school at Mudungarakatte. The Moilar however claimed that he was attacked in a case of mistaken identity. Meanwhile, locals who witnessed the assault rushed to the Konaje police to file a complaint. Some even stated that they saw the attackers near the police station. The local residents made a vehement demand for the arrest of the accused and even alleged that the inspector Sudhaker was trying to shield the Accused. It has been gathered that the Konaje police later arrested one of the accused identified as Prashanth. A case of mistaken identity? What has been learnt as of now is that the attackers actually intended to target a teacher of a Madarasa at Mudungarukatte who was reportedly sexually harassing a lady member of the local panchayat but attacked Muneer by mistaking him for the teacher. Though Muneer filed a complaint against six persons who attacked him, the lady member of the Panchayat lodged a complaint against Muneer alleging that it was he who had sexually harassed her. Konaje police have registered both the complaints and are investigating the case. In another development, ZP member Santosh Kumar Rai Boliyar and social activist SK Hazar of Mudipu participated in a reconciliatory meeting at the Konaje station and finally a compromise was reached upon. As per the compromise both the parties need to settle the court case. You have the police and the court to solve your problems.Recently there was a quarrel in B.C.Road on Harish’s murder. Innocent lost life and once again same is been repeated .